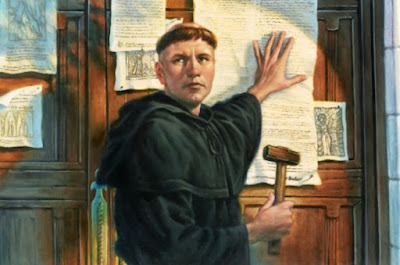 It was 500 years ago today that Martin Luther nailed his 95 theses to the door on Castle Church in Wittenberg, Germany. According to this column, "Martin Luther didn’t intend to create a new movement outside of Catholicism, but rather to reform the Church from within. Nevertheless, his revolt certainly morphed into far more than a protest." I'd say that's the understatement of the millennium. Some people mistakenly believe Luther was the first to question the church's orthodoxy, but that's not correct. 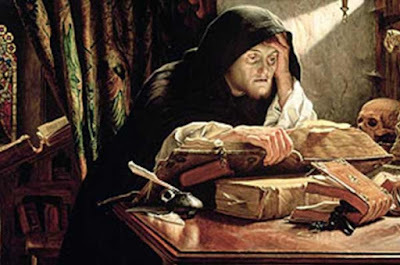 In the 14th century, John Wycliff agitated for translating the Bible into the vernacular and opposed the abuses of the church associated with wealth. Doubtless there were others that had some early influence as well. Luther didn't so much spark a revolution as cement the grumblings that had been going on for several hundred years. Luther's big advantage is he had the power of Gutenberg's printing press. His 95 theses spread like wildfire. Certainly the translation of the Bible into the languages everyone could understand had an astounding impact on Western history. Arguably Luther's actions were ultimately beneficial to the Catholic church as well, which had its own counter-reformation that cleaned up many of the abuses Luther found so objectionable. While these reforms were doubtless necessary, Luther was no saint, particularly regarding his position on Jews. His horrific anti-Semitism, while echoing the prevalent attitude in Europe at the time, exacerbated conditions and likely impacted relations with European Jews for centuries to come. But Luther’s bravery in the face of his convictions cannot be minimized nor dismissed. He was willing to face excommunication at best and a tortuous death at worse for his principles. When he faced Emperor Charles V and defiantly stated, “Thus I cannot and will not recant, because acting against one's conscience is neither safe nor sound. God help me. Amen.” – he was well aware of what might happen. Love him or hate him, Luther's actions on this day 500 years ago ignited a firestorm with reverberations still felt today. He was a game-changer in the religious development of the Western world. I wonder if he had any idea what he was starting? Luther also recreated the Bible in his own image and likeness, throwing out seven books of the Old Testament and changing the New Testament. Now when we look around we see tens of thousands of denominations. How many churches did Jesus found? 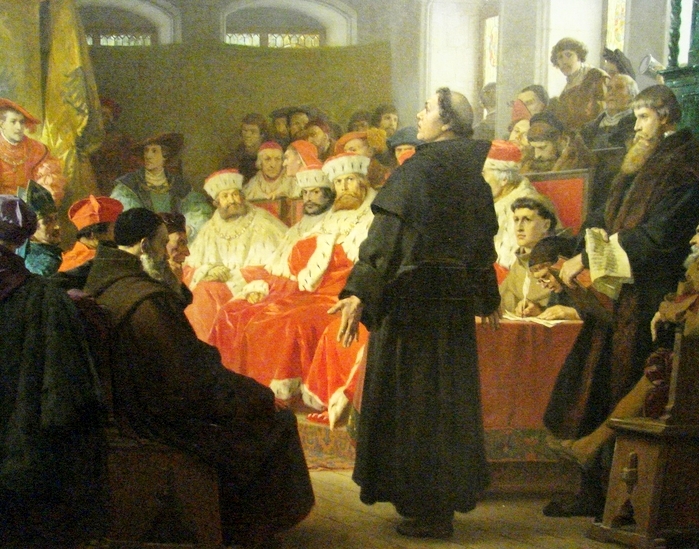 Luther translated the Bible from Latin to German.